Please check our Calendar page to make sure we are available to cater your event. 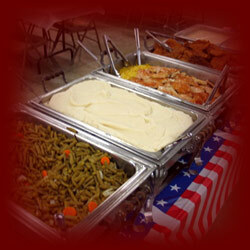 The most complete, professional and affordable catering service in West Central Illinois. We also offer complete outdoor cooking and a carved prime rib buffet. NOTE: Skirting for the brides table and the cake table are available. Nuts, mints, and punch, with bowl and cups available.